I felt like a kid at Christmas today as I unwrapped my latest estate pipe purchases the lovely people at Canada Post delivered to my door. Pipes, pipes and more pipes, 36 in all, from the 1960s through 1990s and mostly Danish in origin, including pipes by Stanwell, Soren & Karl Erik. 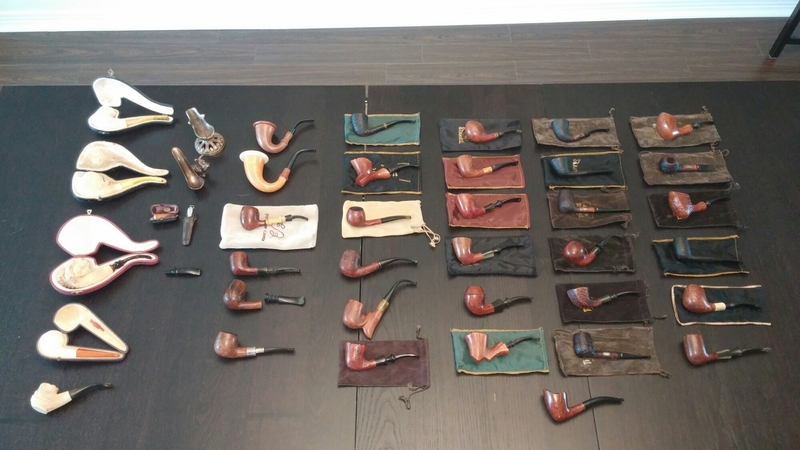 A handful of carved meerschaum pipes, two Calabashes and a few Savinellis rounded out the group. I’m looking forward to digging into these pipes over the next weeks, so watch for the blog posts coming soon. And if you’re a fan of Danish pipes, a great many of these will be listed in the DadsPipes Store when they’re ready to go. LOL I will, on both counts! Great new selection. You know you’ve been smoking pipes and long time when you know the pipes just by looking at the picture. Oh Charles how I wish I had your dilemma. Nice looking batch. Charles, did you leave any for the rest of us? Nice haul. I see plenty in there that’s got me interested. There are some beauties in there Charles. Have fun! Thanks! I’ve already dug into the pile. Should have posts up soon if I can find the time to write! That Stanwell second from the top on the very right… must be mine one day. I’ll get em all done eventually Paul. That’s one of a half dozen Stanwell Pipes of the Year in the collection. Six-Day Set, anyone?? What a shame to have only one mouth to smoke with. Now I understand women’s frustration with having only two feet when the world is full of so many pair of shoes.